The Colegio Waldorf in Lima, founded in 1982, is the oldest school offering Waldorf education in Peru. It is a comprehensive school providing services from kindergarten all the way to the Peruvian high school diploma. The Colegio and Panguana have enjoyed a very rewarding cooperation since 2013, when it began with a very dedicated initiative out of Zurich, Switzerland. 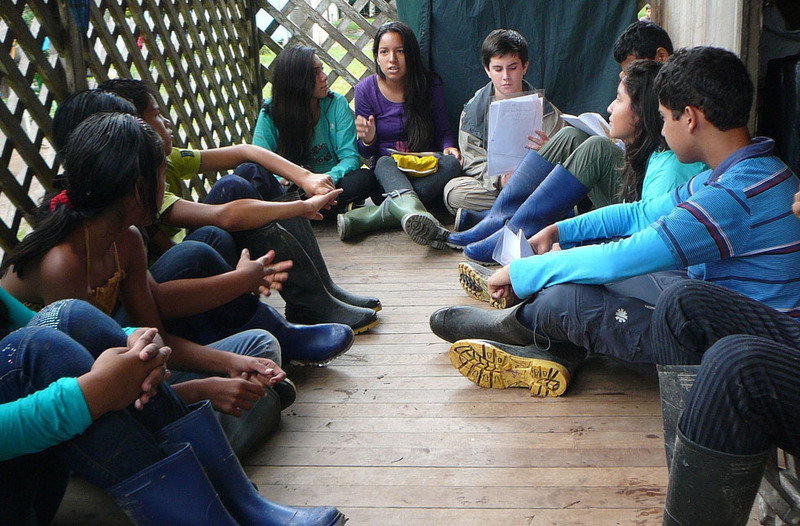 Since then, there have been three journeys to the Panguana rainforest by Waldorf school delegations, and responses have been so good that, fortunately, continuation of this innovative project is guaranteed for several years to come. In accordance with the goal of Waldorf education to foster the development and formation of the children in a holistic way, a many-faceted and sophisticated program was designed for each of those journeys. The general aim is to introduce young people, many of whom have never been to the rainforest before, to this initially alien habitat in a special way that includes, among others, the topics of creativity, hands-on design and manufacturing as well as social sensibility, and that builds and increases the individual student’s capacity for self-initiative. Once every year a group consisting of about 30 students in senior classes and 5 tutors visits Panguana to work a project that contributes to rainforest conservation, involves participation in the daily duties at the station, and includes reasonable integration in forest life as well as cooperation and exchanges with students from the local schools. The aim is to alert young people to how important nature in general and the rainforest in particular is for them and for their country, to raise their conscious responsibility for the conservation of this habitat, and at the same time to contribute to mutual awareness between people from the very different Peruvian regions along the coast and in Amazonia. While working actively towards the project objectives the students develop a much richer sense and understanding of life in the rainforest, which is hoped to motivate them to contribute to conservation from conviction, and to pass on to others what they have learned. The Waldorf school’s projects at Panguana may also help to increase the interest in such topics among the local youth. The program design for the first journey to Panguana in 2013 essentially aimed at becoming familiar with the place and assessing project opportunities there, but also already included first ecological internships. Activities in the subsequent years then focused on rainforest conservation and sustainable, long-term reforestation of suitable areas close to Panguana. and for immediate outdoor plantations, saplings of native species characteristic for the region will be obtained from nearby nurseries. Corresponding plans target 20 different species, among them fast-growing trees and palms to shade the ground and young trees on reforestation plots.